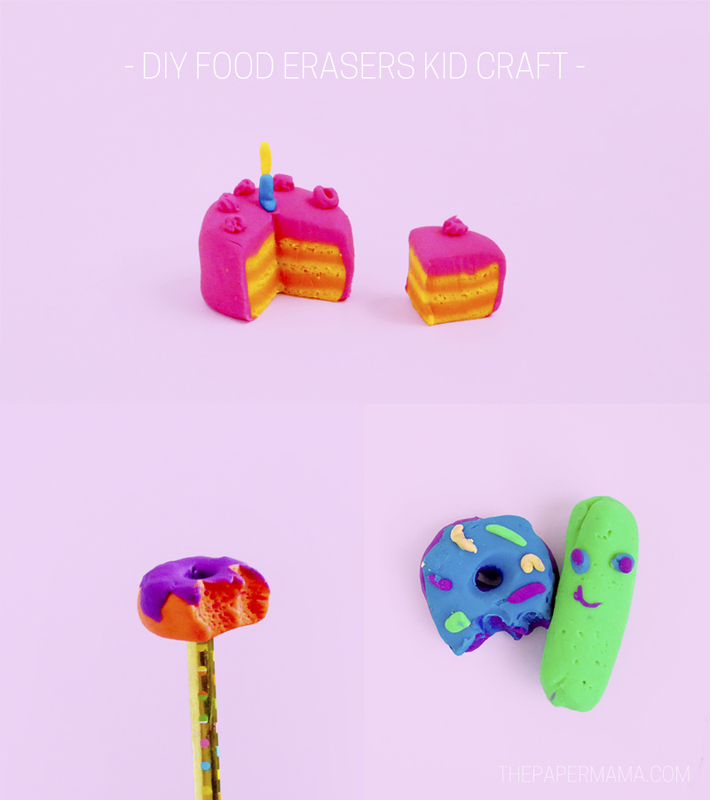 Fun Crafting with the Kids: DIY Food Erasers Kid Craft! I may craft and make things for a living, but that doesn’t stop me from also crafting with my daughter. To be honest: crafting with my daughter is much more enjoyable than a lot of other art projects I work on. When I’m making things with her I try to be less of a perfectionist (I try) and it’s fun to see what she can do. She usually wants me to make my own version of whatever craft we are making, and she will make hers all on her own (with a little help from me here and there). We recently started watching Creative Galaxy on Amazon Kids. The show is a “make-along, create-along” cartoon and it really inspires my kiddo! Each show highlights a creative craft (painting, music, sculpting, cooking, etc.) and it encourages kids to get excited about their own creative ideas and the process of using creative arts to solve problems. We may have zoomed through the whole first season, but luckily the second season of Creative Galaxy is starting on the 16th! SO, since my daughter just started first grade (wow, time is flying by) today’s fun kid-project is all about erasers! 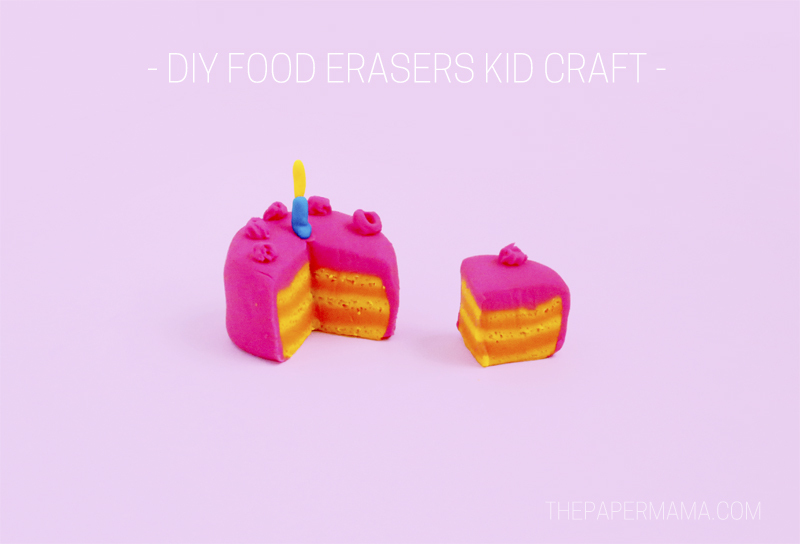 Did you know you could make your own erasers? I had no idea. I was at the craft store and found this clay eraser kit right next to all the polymer clay. And, guess what? The erasers actually work! Sculpting tools: something metal with a skinny flat side to cut (safe for kids to use), a few toothpicks, tweezers, and anything else you think might help. A straw to make bite marks. An oven to bake the erasers! 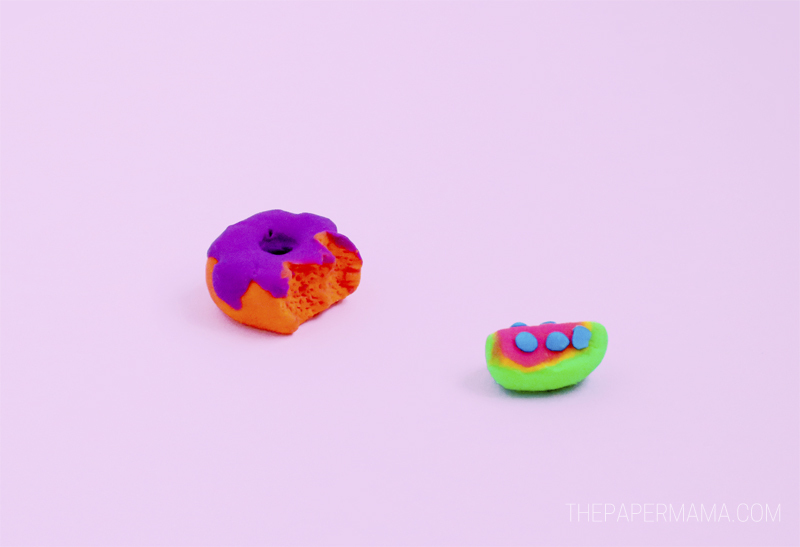 Check out my video to see how we crafted each eraser (click on “full screen” to see the larger video)! 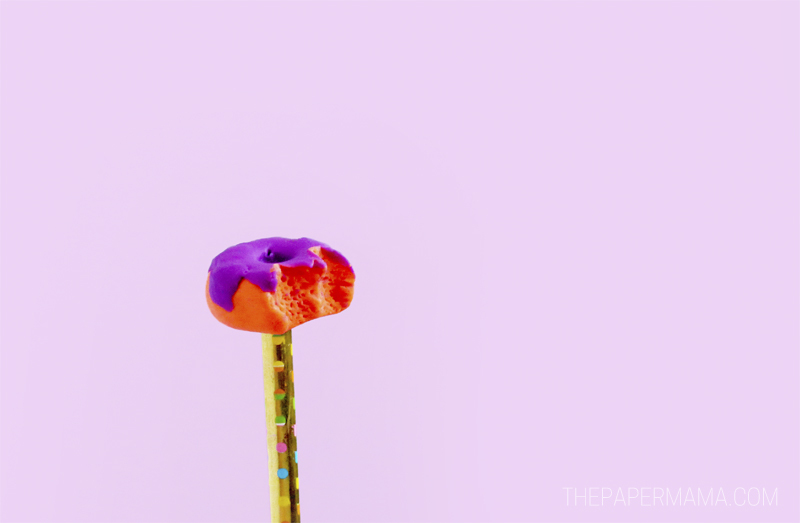 TIP: After we made this video I did realize there might be an easier way to keep the erasers from squishing when you cut them. Pop them in the freezer for about 30 minutes and THEN cut them. Our watermelon got pretty squished during the cutting process, but it’s still fun and cute! After we made these erasers my daughter felt confident to make her own set and she surprised me with them. How cute are they? 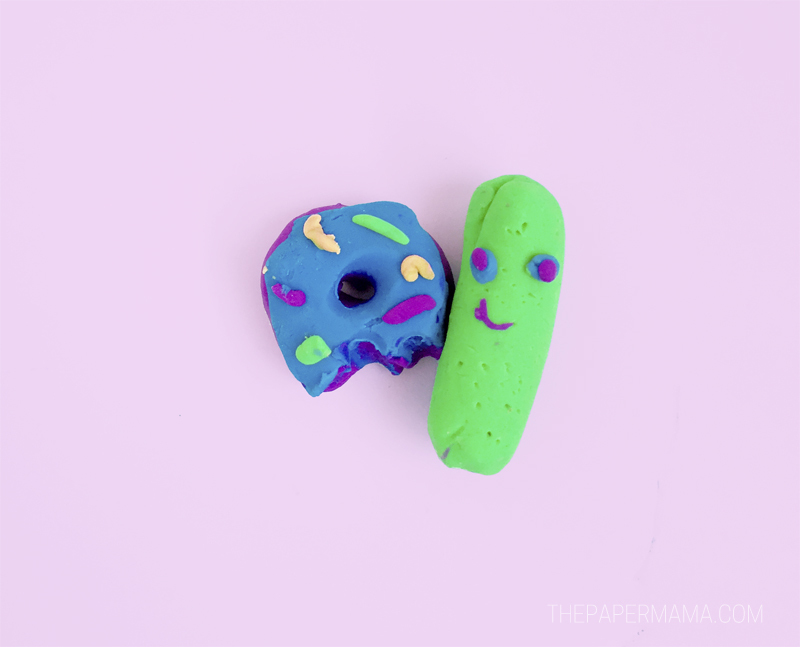 She added sprinkles to her doughnut and she made a pickle guy all by herself. Ha! The whole project costs were under $10 and we made a lot of erasers with that clay! If you need some more kid crafting inspiration I suggest you really do check out the Creative Galaxy show on Amazon Kids. A lot of kids shows drive me nuts, but this one is a-okay in my book. Check out the trailer for season 2 to see what fun you might find while watching. I always want to see what you’re crafting! You can share a link to what you’ve made in the comments below, or tag me on Instagram with a photo (my user name is @thepapermama). I might share your craft on my IG! P.S. This is a sponsored post from Amazon Kids. I was paid to share this fun kid craft with you! Creative Galaxy, from Out of the Blue Enterprises (Super Why!, Daniel Tiger’s Neighborhood), is a “make-along, create-along” animated art adventure series that celebrates creative thinking through crafts, story, music, and dance. The series follows the adventures of Arty and his silly side-kick Epiphany, as they travel around the galaxy to solve problems using many different forms of art. Each episode highlights a unique creative medium (painting, music, sculpting, cooking, etc.) to reinforce to kids that art is all around us in many different forms. The interactive stories and live action segments encourage young viewers at home to get excited about their own creative ideas and the process of using creative arts to solve problems! And the second season is kicking off with twice the fun. Season 2 features 11 brand-new, two-part episodes with 24 live action craft segments – and many famous friends! Brooke Shields, Jason Priestly, Samantha Bee, Lisa Loeb, Donovan Patton and Cloris Leachman are just some of celebrities who lend their voices to characters who appear throughout the show.